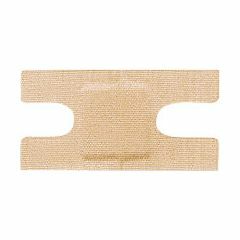 Coverlet Adhesive Dressing - Knuckle Bandage, 1.5" x 3"
By RADIOMAN143 from READING PA.
Beiersdorf Coverlet Adhesive Dressing - Knuckle Bandage, 1.5" x 3"
Coverlet Adhesive Dressing - Knuckle, 1.5" x 3"
360-degree adhesive coverage. The island would pad seals off the wound from dirt and contamination. Conforms to curves and contours of skin better than other dressings. Stays on longer. 1 1/2" x 3" gauze knuckle. Even adherence. Easy to remove. SHOULD BE SOLD IN 100 AMO. HGVCGVCHGVHJMKKJN,. NA . Unique shape works well on knuckles. It covers the skin where there i great deal of joint movement.